In 2013, Sarah was awarded a PhD Studentship through a research grant to join the BRIGHTLIGHT study team, sponsored by London South Bank University. Sarah’s particular part of the project is a case study looking at the culture of care and care experiences of teenagers and young adults with cancer, not only in specialist centres but also out in different hospital settings. Sarah is now at the final stages of her doctorate, with her viva planned for spring this year. Previously a Sports Therapist and then qualifying as a children’s nurse as a post-graduate, Sarah has worked as a staff nurse in the teenage and young adult cancer service in University College London Hospital alongside doing her PhD. 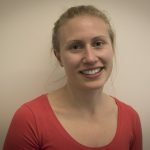 Last year, she stepped away from the clinical area to focus full-time on her development as a researcher, and currently works as the Research Facilitator for the BRIGHTLIGHT team. This role entails both working on aspects of the BRIGHTLIGHT study itself, in addition to working on some of BRIGHTLIGHT’s affiliated studies. Sarah continues to have a strong passion for all things sporty, particularly enjoying CrossFit, dance and kayaking. She is a kayaking coach and takes students away on trips around the UK to coach them on white water.